Perception is the foundation of human experience, but few of us understand how our own perception works. By revealing the startling truths about the brain and perception, Beau Lotto shows that the next big innovation is not a new technology: it is a new way of seeing. In his first major book, Beau Lotto draws on over ...a dál? Produkt Beau Lotto: Deviate neprodává žádný obchod s kamennou pobočkou. Zobrazte si všechny obchody nebo zkuste podobné produkty. Produkt Beau Lotto: Deviate nemá žádný obchod skladem. Zobrazte si všechny obchody nebo zkuste podobné produkty. Produkt Beau Lotto: Deviate neprodává žádný obchod s možností platby kartou. Zobrazte si všechny obchody nebo zkuste podobné produkty. Perception is the foundation of human experience, but few of us understand how our own perception works. By revealing the startling truths about the brain and perception, Beau Lotto shows that the next big innovation is not a new technology: it is a new way of seeing. In his first major book, Beau Lotto draws on over a decade of pioneering research to show how our brains play tricks on us. With an innovative combination of case studies and optical and perception illusion exercises, Deviate will revolutionise the » ... a dál? Perception is the foundation of human experience, but few of us understand how our own perception works. By revealing the startling truths about the brain and perception, Beau Lotto shows that the next big innovation is not a new technology: it is a new way of seeing. In his first major book, Beau Lotto draws on over a decade of pioneering research to show how our brains play tricks on us. With an innovative combination of case studies and optical and perception illusion exercises, Deviate will revolutionise the way you see the world. With this new understanding of how the brain works and its perceptive trickery, we can apply these insights to every aspect of life and work. 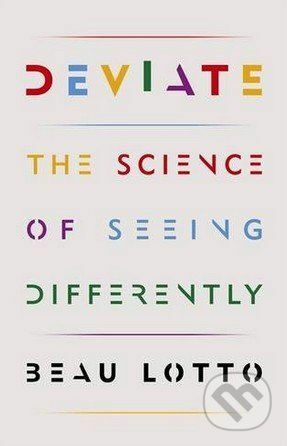 Deviate is not just an engaging look into the neuroscience of thought, behaviour and creativity: it is a call to action, enlisting readers in their own journey of self-discovery.